The conclusion of the Second World War saw the Canada, the United States and Great Britain considering the standardization of their armed forces' weapons, tactics and training. This intent was confirmed by British Prime Minister Clement Atlee in a November 18, 1946 speech. An agreement was signed between the three countries in 1947, expressing an intention to standardize everything from screw threads to radar bandwidth, with an emphasis on small arms ammunition (disparities in which had caused many headaches during the Second World War). Interestingly, it was the junior member of the triumvirate, Canada, that was the motivating force behind the agreement. Military planners in Canada were very aware of their country's need to standardize with its alliance partners, as dictated by the relatively small size of the Canadian Army. wartime 7.92mm Kurz intermediate cartridge, and were willing to devote substantial time and energy to the study of practical, aimed selective fire. By the end of the war, the British no longer considered rifle fire practical beyond 700 yards, and moved wholeheartedly toward developing a low recoil automatic rifle and cartridge that would allow for effective, aimed automatic fire. To this end, the British Armament Design Establishment (ADE) developed the .280/30 cartridge and the radical EM-2 bullpup rifle to fire it. conventional design and as a "bullpup." Both versions, chambered in 7.92mm Kurz, were offered to the British for evaluation in 1947. The British Ministry of Defense approached FN with a request to modify the rifle so that it would fire the .280/30. The resultant product was christened the "Lightweight Automatic Rifle" or as the FN documents referred to it, the "Fusil Automatique Legere" (FAL). the Aberdeen Proving Ground, in Aberdeen, Maryland, from February to April 1950. The results of the trials were disappointing, with numerous instances of breakage, malfunctions, and poor performance by all the candidate rifles. All parties generally agreed that the trials had been held well in advance of the necessary engineering tests (Many of the problems were traced to incorrect heat treatment, improperly applied protective finishes, and internal parts too closely toleranced. ), and that this had contributed to the less than stellar results. The Army is firmly opposed to the adoption of any less effective small caliber cartridge for use in either its present rifle, or in the new weapons being developed. Any new rifle cartridge must have wounding power, penetration performance, and ballistics at least equal to that in use today. Battle experience has proven beyond question the effectiveness of the present rifle and ammunition and there have been no changes in combat tactics which would justify a reduction of rifle caliber and power. Interestingly, the Americans thought that the FAL was the best of the submitted designs, being especially impressed with the ease of field stripping. unanimously agreed that any decision on the adoption of a new round of small arms ammunition would not affect the immediate situation, and that in order to permit the arming of NATO countries as rapidly as possible, the presently accepted standard ammunition and weapons should be continued in production for some time. . . .as early as practicable, a new round of small arms ammunition should be adopted. For all intents and purposes, the .280/30 had been shelved. Over the next few months, a number of attempts were made to bring the parties to a meeting of the minds: The NATO Standing Group on Rifle Standardization produced yet another set of requirements; FN offered the 7mm High Velocity - a US T65 case necked down to 7mm; and the British offered the .280/30 necked up to .30 caliber. Everything was rejected out of hand by US Ordnance. By mid-1952, all indications were that the US rifle program was swinging in the direction of the T44 (which later became the M14). As a compromise, both the British and FN offered their respective rifles to the Americans for testing chambered for the T65 cartridge. The rifles underwent tests at Fort Benning, Georgia from August 22 to December 29, 1952. After the results were tabulated, the Army Field Forces Board recommended that both the T44 and FAL rifles be further developed and retested prior to a final decision. The Board also suggested that the T25, the T47, and the EM-2 be eliminated from consideration. Furthermore, an order was placed with FN for 3,303 FAL rifles with the latest US test modification suggestions. These rifles were designated "Rifle, Cal. .30 T48 FN." This was the first recorded use of the nomenclature "T48." This was a red-letter day for the FAL. A procurement on this scale usually indicated that the final stage had been reached in the development process prior to adoption. The FN rifles were supplied in two forms. The basic T48's (3,103) were equipped for semiautomatic operation only. They were fitted with the standard weight barrel and had stripper clip guides for the early horseshoe style clips on both the dust cover and the receiver bridge. The US designed flash suppressor with integral bayonet lug was provided. The remaining 200 rifles, designated the T48E1, were built with heavy barrels, automatic selector switches, and a bipod. They also used a different flash suppressor (lacking a bayonet lug), and lacked stripper clip guides. The handguard on the automatic rifles was beefier on the sides and more open on top to allow for better cooling and ventilation. Additionally, a folding buttplate was added. In December of 1953, the testers at Fort Benning packed up their T44's and T48's and shipped them off to Alaska for arctic weather trials. The T44's, in the care of Springfield Armory personnel, had been undergoing special preparation for the arctic trials for weeks with the aid of the Armory's Cold Chamber. A significant reduction in gas pressure was found to occur in sub-zero temperatures, with the result that gas systems performed much differently than normal. Accordingly, adjustments were made to the T44's; gas regulators were redesigned to account for cold and normal firing conditions, magazines buffed and polished internally to improve function, etc. The T48's received none of this "preparation." As a result, while the T44's were performing well in the arctic trials, the unprepared FAL's began to experience gas system problems immediately. Ernest Vervier, and FN engineer, was immediately sent to Alaska. He diagnosed the problem and opened up the rifles' gas ports. While this cured the sluggishness, it created additional problems. The FAL's all demonstrated early and violent extraction, violent ejection, and broken parts as a result of the increased pressures caused by the larger gas ports. Not surprisingly, the T48's received very poor marks from the arctic test staff. As a result, the 3,303 T48's being prepared in Belgium created an embarrassing problem as adoption was no longer an immediate possibility. Instead of being issued for troop trials of the T48 rifle itself, the T48's would be used in an operational research test on the "Practicality of the Single Rifle Concept." The trials were designed to see if one rifle system with both light and heavy barrel variants could replace the conventional rifle, carbine, submachinegun and BAR. While the Single Rifle trials were taking place in the US, events were moving forward in Europe. In Britain in July 1953, the British Ministry of Defense formally recommended the adoption of the FAL rifle and the T65 cartridge. Alliance wide the ammunition standardization question was being resolved. NATO announced that the new common cartridge would be the US T65 on December 15, 1953. At the Small Arms Ammunition Standardization conference, held in Ottawa in January 1954, NATO adopted an improved version of the T65 cartridge (T65E3), giving it the designation 7.62mm NATO, and detailed specifications were finalized in February 1954. 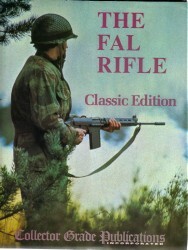 The Canadians too adopted the FAL, in January 1954. The British adoption of the FAL and the T65 placed the Americans in an awkward position. It was largely understood that there had at least been an informal agreement that the Americans would adopt the FAL if the British adopted the T65 cartridge. Back in the United States, the Single Rifle trials were still proceeding, but not without some difficulty. In order to make modifications required by the 1953 - 1954 arctic tests, the metric drawings supplied by FN first had to be converted to in dimensioning and US manufacturing practices. The steels described in the FN specifications had to be changed to materials covered by US military standards. American heat treatment procedures, screw threads, finishing techniques, and nomenclature all had to be substituted for the European. Springfield Armory was named as the supervisory agency for this effort, and the High Standard Manufacturing Company of Hamden, Connecticut was selected as the prime contractor to carry out the work. High Standard was also to prescribe changes to the FAL design which would aid in domestic production. To validate its engineering drawings, High Standard was to build twelve T48's from them. produce 500 T44's, with drawings supplied by the Mathewson Tool Company. H&R sent a team to study the Canadian production methods (Canada had adopted the FAL in January 1954). The Canadian drawings were much further advanced and refined than those made by High Standard; on the other hand, the High Standard drawings included the latest modifications. As a result, there were some differences between the High Standard and H&R guns. Both the T44 and the High Standard produced T48 participated in the US arctic tests in the winter of 1954 -1955. Both were determined to be fit for arctic use, with a slight preference toward the T44. On a larger scale, with all three alliance partners (US, UK, Canada) standardized on the 7.62mm NATO, an American decision based on what the US really wanted in a rifle would no longer unduly strain any diplomatic relations - the ammunition standardization question had been by far the most important issue. From this point on, published US test data would begin to show a marked preference for the T44. Not that the T48 contractors didn't do their part. The April 1955 Fort Benning tests had to be stopped due to dust jams in the High Standard T48's. Parts that were too closely toleranced had caused serious jamming to happen during the dust and sand tests. As a result, the T44 was judged better by Army Field Forces Board No. 3. The rest of NATO continued to press for US adoption of the T48. The 1956 trials began on schedule using the new H&R T48's, but they immediately failed the standard accuracy test. Scrutiny revealed that the test guns all had oversized bores due to confusion on H&R's part. New barrels were fitted and acceptable accuracy rendered. Assess an extent to which previous deficiencies have been corrected in each weapon, and reliability exhibited by each type. What it did NOT do was to express a preference for one over the other, but instead, found both suitable. As a result, the decision wound up on the desk of the chief of staff of the US Army. Weighing heavily in favor of the T44 was the fact that it was a pound lighter than the T48, as well as the idea that due to its similarity to the M1, it could be manufactured on existing machinery (In the event, this turned out to be false; new machinery was needed). The adoption of the T48 was seen as a high cost, high risk affair. Consequently, on May 1, 1957, Secretary of the Army Wilbur Bruckner announced the adoption of a new standard rifle for the US Army. The T44 was henceforth to be known as the US Rifle, 7.62mm, M14. With the conclusion of the American FAL program, the T48's in inventory were stored, given away to museums, or simply cut up into scrap. The other NATO members were disappointed at the American decision to reject the FAL in favor of the M14. The only positive result of their time and effort was the adoption of the 7.62mm NATO cartridge. Secure Communications with PGP Results From Cruffler Matches One And Three And A Consolidated Match Database! The Bestin South American Military Surplus from JLD Enterprises, Featuring M1911A1 Style .45's! Payingby Credit Card with PayPal.com!